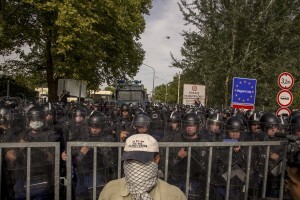 On September 16, 2015 the Hungarian police used water cannons and tear gas to disperse a group of migrants who, through the pass of Horgos, tried to enter the country from Serbia, forcing one of the fences that enclose the borders of Hungary. In the crowd there were also many children affected together with their families. The right-wing nationalist government led by Viktor Orbán has completely closed the border with Serbia on September 15, after the entry into force of new rules that make irregualar migration punishable by law. Before the closure of the border, more than 200 thousand people have arrived to Hungary this year, entering the Schengen Area of the European Union, with the idea of crossing the country and going to Germany or other European countries. Migrants near the Serbian border with Hungary in Horgos, Serbia on September 15, 2015. Hungary’s border with Serbia has become a major crossing point into the European Union for migrants, with more than 160,000 accessing Hungary so far this year. Migrants sleep on the street near the Serbian border with Hungary in Horgos, Serbia on September 15, 2015. Hungary’s border with Serbia has become a major crossing point into the European Union for migrants, with more than 160,000 accessing Hungary so far this year. A migrant sleeps on the street near the Serbian border with Hungary in Horgos, Serbia on September 15, 2015. Hungary’s border with Serbia has become a major crossing point into the European Union for migrants, with more than 160,000 accessing Hungary so far this year. 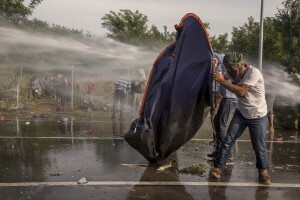 Migrants are seen near the Serbian border with Hungary in Rozske, Hungary on September 15, 2015. The right-wing nationalist government led by Viktor Orbán has closed the entire border with Serbia on September 15, 2015 after the entry into force of new rules that make it illegal and punishable by law. Hungary’s border with Serbia has become a major crossing point into the European Union, with more than 160,000 access Hungary so far this year. Military are seen near the Hungarian border with Serbia, in Rozske, Hungary on September 15, 2015. The right-wing nationalist government led by Viktor Orbán has closed the entire border with Serbia on September 15, 2015 after the entry into force of new rules that make it illegal and punishable by law. Hungary’s border with Serbia has become a major crossing point into the European Union, with more than 160,000 access Hungary so far this year. A Syrian family in a camp near the Serbian border with Hungary in Horgos, Serbia on September 16, 2015. Hungary’s border with Serbia has become a major crossing point into the European Union for migrants, with more than 160,000 accessing Hungary so far this year. A migrant near the border that divides Serbia and Hungary in Horgos, Serbia on September 16, 2015. Hungary’s border with Serbia has become a major crossing point into the European Union for migrants, with more than 160,000 accessing Hungary so far this year. A migrant is seen near the Serbian border with Hungary in Rozske, Hungary on September 15, 2015. 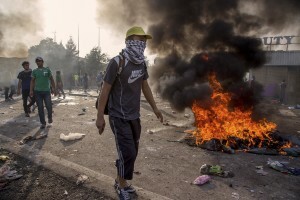 The right-wing nationalist government led by Viktor Orbán has closed the entire border with Serbia on September 15, 2015 after the entry into force of new rules that make it illegal and punishable by law. Hungary’s border with Serbia has become a major crossing point into the European Union, with more than 160,000 access Hungary so far this year. 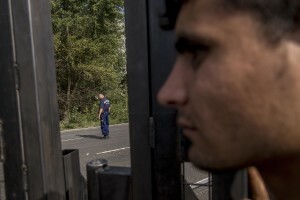 A migrant is seen in front of Hungarian anti-riot police at the Serbian border with Hungary in Horgos, Serbia on September 16, 2015. Hungary’s border with Serbia has become a major crossing point into the European Union, with more than 160,000 access Hungary so far this year. Hungarian riot police using a water cannon against protesting migrants on the Serbian side of the border in Horgos, Serbia on September 16, 2015. Hungary’s border with Serbia has become a major crossing point into the European Union, with more than 160,000 access Hungary so far this year. 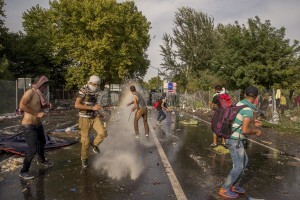 Migrants throw rocks and try to remove the gates during clashes with Hungarian anti-riot police at the Serbian border with Hungary in Horgos, Serbia on September 16, 2015. Hungary’s border with Serbia has become a major crossing point into the European Union, with more than 160,000 access Hungary so far this year. A woman flees with her children after Hungarian riot police using tear gases against protesting migrants on the Serbian side of the border, near Horgos in Serbia on September 16, 2015. Hungary’s border with Serbia has become a major crossing point into the European Union, with more than 160,000 access Hungary so far this year. Migrants try to remove the gates during clashes with Hungarian anti-riot police at the Serbian border with Hungary in Horgos, Serbia on September 16, 2015. Hungary’s border with Serbia has become a major crossing point into the European Union, with more than 160,000 access Hungary so far this year. Migrants behind the gates that separates Serbia from Hungary in Horgos, Serbia on September 16, 2015. Hungary’s border with Serbia has become a major crossing point into the European Union, with more than 160,000 access Hungary so far this year. 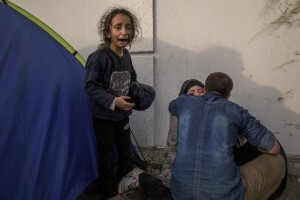 A little girl cries with her family during clashes with Hungarian anti-riot police at the Serbian border with Hungary in Horgos, Serbia on September 16, 2015. Hungary’s border with Serbia has become a major crossing point into the European Union, with more than 160,000 access Hungary so far this year. 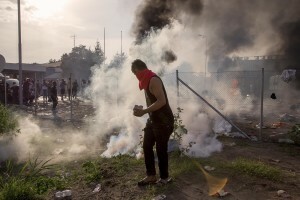 A migrant is seen during clashes with Hungarian anti-riot police at the Serbian border with Hungary in Horgos, Serbia on September 16, 2015. Hungary’s border with Serbia has become a major crossing point into the European Union, with more than 160,000 access Hungary so far this year. Migrants injured after the clashes with Hungarian anti-riot police at the Serbian border with Hungary in Horgos, Serbia on September 16, 2015. Hungary’s border with Serbia has become a major crossing point into the European Union, with more than 160,000 access Hungary so far this year. A man holds a syrian girl in front of the the Hungarian anti-riot police at the Serbian border with Hungary in Horgos, Serbia on September 16, 2015. Hungary’s border with Serbia has become a major crossing point into the European Union, with more than 160,000 access Hungary so far this year. 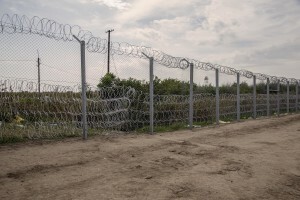 A general view of the Hungarian border with Serbia in Rozske, Hungary on September 15, 2015. The right-wing nationalist government led by Viktor Orbán has closed the entire border with Serbia on September 15, 2015 after the entry into force of new rules that make it illegal and punishable by law. Hungary’s border with Serbia has become a major crossing point into the European Union, with more than 160,000 access Hungary so far this year.